While I realize the solstice was this past week, it's well-documented that summer in Seattle doesn't occur until July 12th, or at least after July 4th. So when N suggested we have homemade pasta for dinner, I was game even though it's the end of June! I dug into Marcella Hazan's Essentials of Classic Italian Cooking to look for some recipe ideas. I love her tomato sauce with butter and onions, so I figured it was a good place to start. 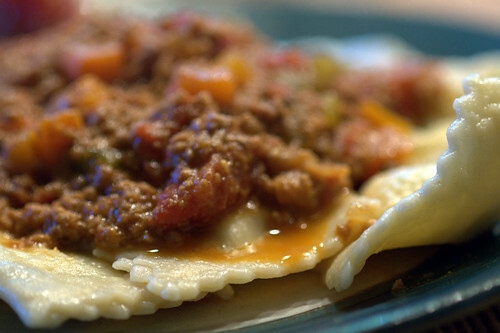 After flipping through the cookbook for a while, I decided on a ragú alla bolognese and cheese ravioli. 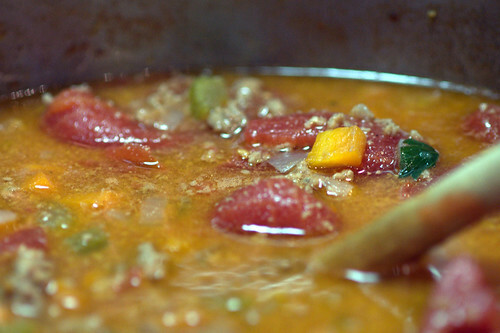 Hazan's notes on the Bolognese suggest that the longer you cook it, the better. I ended up simmering the sauce for over five hours. It was a very layered cook. First you sweat the onions, then add the celery and carrot. After they have cooked for a bit, you add the meat and cook it until it is no longer red. Then you add the milk and cook it until it has bubbled away. Add nutmeg, then dry white wine. Simmer until the wine has evaporated, and then add the tomatoes. Simmer over super low heat for at least three hours. I expected the sauce to be more dimensional after all of that but it seemed very boring and plain to me. Not inedible, just not spectacular. I also used Hazan's recipes for pasta dough and ravioli filling. 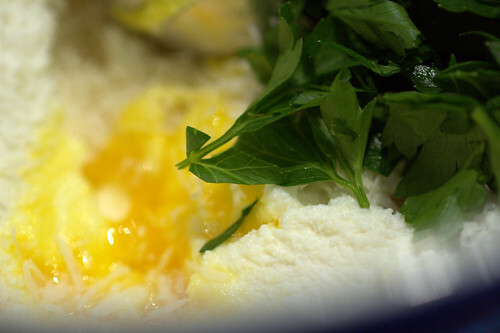 The filling was a very basic cheese filling made of ricotta, parmesan, an egg yolk, a lot of parsley, and salt. I've had issues in the past when I try to do too much with ravioli filling, so I went simple. Unfortunately when I went to roll out my pasta dough, I discovered that I didn't have the crank for my pasta machine. Crap! I rolled the dough out by hand, but I wasn't quick enough and by the time I got to the end of the dough, I had a difficult time getting the dough thin enough and had to give up with some dough remaining. I was a little afraid we didn't have enough ravioli! 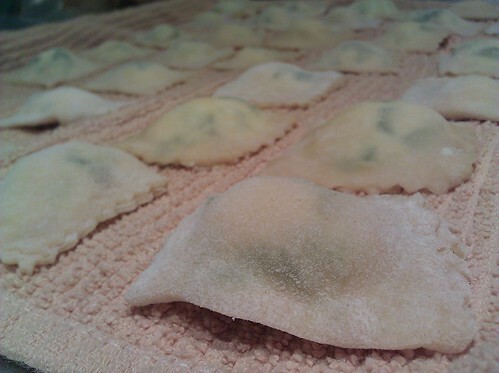 I also messed up when I cut the ravioli -- I meant to make them larger so we had more filling per ravioli. Some day I'll get that right. 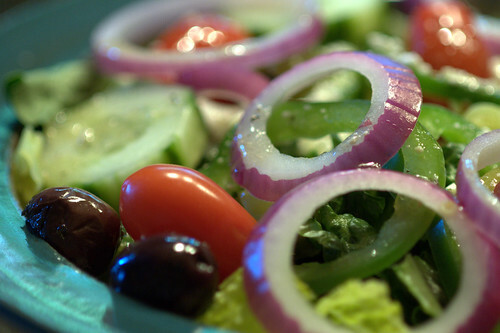 N asked me what he could do to help and after he cleaned the dining room table, he decided that he would make us Greek salads. I am very glad he did -- they were tasty and also pretty. I was afraid we didn't have enough pasta, but luckily the salads were so large that we survived and even had leftovers remaining. I totally did not get a picture of the zucchini and onions I made. This was also in Hazan's cookbook, but it was so simple. Caramelize very thinly sliced onion in some butter over medium heat, then turn the heat up and add about an inch thick layer of super thin sliced zucchini rounds and sauté until cooked through. I actually cooked this about 45 minute in advance and then carefully heated it up over low heat, which worked well. Totally simple but they were really tasty! When I first started eating solid foods, Mom used to make this for me (minus the onions) instead of baby food. Yum! N pulled out a new to us game first thing -- Dixit (bgg). This was a game that Shannon suggested I might get a kick out of. It was a quick game and very unlike the games we normally play. I like the art and the presentation. It was difficult in many cases to come up with a card in hand to trick people into voting for. I was surprised that N enjoyed it as much as he did! Of course he kicked our butts, so maybe that has something to do with it. After a round of Dixit, I pulled out Ra (bgg). It went fairly well after the first epoch -- I think we all remembered how to play it. I still am not sure about strategy in auction style games. Sometimes it is difficult to ensure you get a civilization tile in your set to avoid the big -5 points at the end of the epoch! Finally we finished off the night with some mindless, contentious Uno. There wasn't enough arguing in the earlier games to satisfy, I guess! See you next weekend! Maybe we can play Dominion? Well, I made a bad watercolor food painting. I was so indecisive with this meal. I wanted to do a little bit of everything, which, turned into mud. First, I used the rhubarb in the garden, for the spiced rhubarb chutney you suggested from epicurious. G indirect heat + lightly smoked the pork loin (with apple wood) then finished with a glace of soy sauce, honey, and brown sugar. 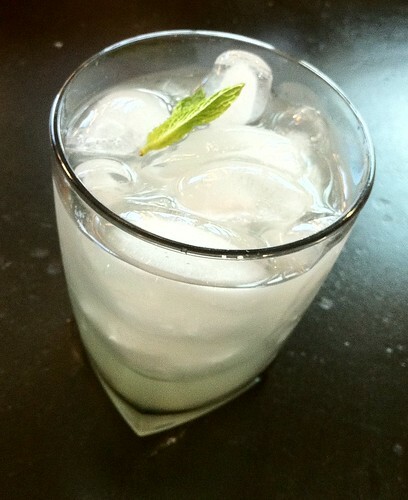 With the rhubarb and ginger handy, I made a simple syrup with this at the farmers market recipe. 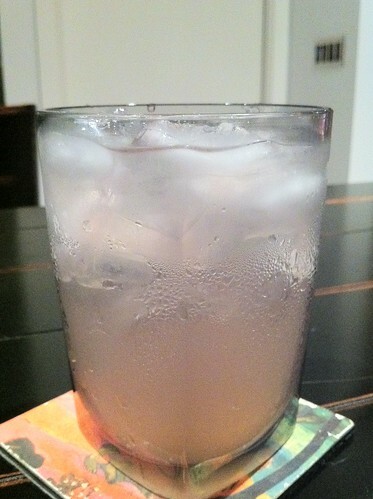 Added ice, club soda, and white rum for an instant beverage. I asked G to taste the syrup. He made a sour pucker face and said it locked up his jaw. Even though I liked the slight pink color of the drink, I did not particular care for the taste. It was missing something. Perhaps a hint of lime, or gin (instead of rum) may help it. I am thinking all drinks from now on should be 3+ ingredients. Two seems a bit, well, two dimensional. Remember last week, N mentioned the cherry rosemary pan sauce? I thought it sounded tasty. Coincidentally, the July issue of MSL has a tart cherry and rosemary focaccia recipe. We don't have tart cherries around here, so I attempted it when sweet cherries and turned it into a sweet & savory snack. I drizzled a little olive oil and sprinkled fleur del sel on top. The dough definitely could have used more pat down, more rosemary, and more cherries. Next time, I will work the rosemary into the dough and perhaps a more level & dimple surface may help the salt stick to the surface. Also, I looked around and found other recipe that mixes bread flour with all purpose, like this one from Simply Recipe. Her dough also looks more stiff. Hmm. Then at the grocery store, I saw fresh fava beans and thought, "oh, that could be a curious adventure." I blanched the beans for a couple of minutes, shelled and peeled. It is amazing amount of work for those little precious beans. I quickly sautéed with the garlic scape from your garden. Shaved some Parmesan on top. I have only had good fava beans once, at a friend of mine's restaurant. I now understand The Big Deal with Fava Beans. So. much. work. Edamame would be a very good substitute. Lastly, I assembled all the miscellaneous ingredients we've accumulated over the week to make a bread salad, loosely based on this Rustic Bread Salad recipe from epicurious. I roasted the cherry tomatoes in 450° oven until they burst and caramelized, set aside. Then roasted asparagus, yellow and red peppers. Quickly toasted the day old baguette with olive oil and garlic in a hot pan. Tossed all the roasted vegetables with marinated red onions, fresh cucumbers, basil, seasoned and dressed with oil and balsamic vinegar. It was a hefty side. Oops. 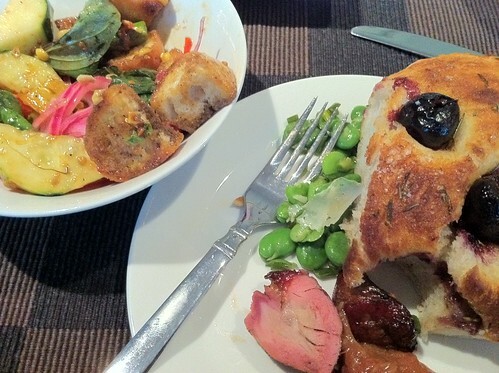 The meal overall felt like an incoherent mix of dishes - from the heavy bread salad, to the pink beige color of the chutney, to the cherries that wouldn't stay on the focaccia, this meal has lots of trials, which means, many opportunities to try again! After dinner, we played Puerto Rico. On queue, G suggested Acquire. 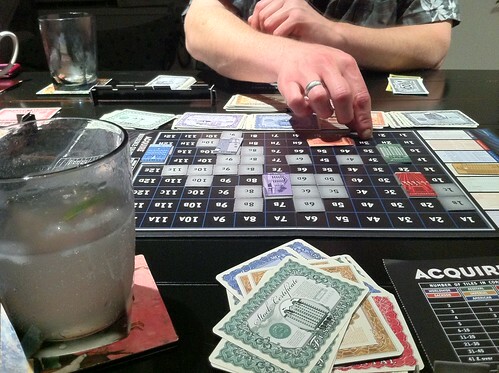 I am glad we didn't play Acquire, again. 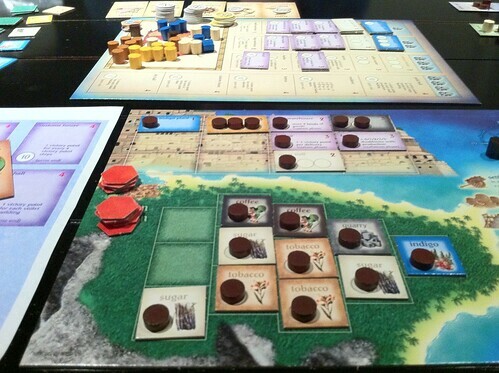 Since we haven't played Puerto Rico in a quite while, we had to look up the rules. (Not to mentioned we played it wrong last few times on the roles and actions.) N was frustrated with the rule look ups. And of course, G and N ended up arguing. Here is to the next time we play, that it will be smooth(er) and the game may grow on N, like fungus. And remember, warehouse, harbor, and factory. Normally we do a lot of cooking by color and avoid monochrome meals, so I was a little surprised when our meal was so overwhelmingly green last week! 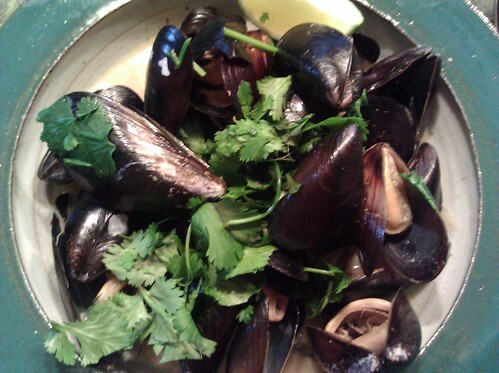 N made Thai green curry mussels, a favorite dish he grew to love while working in London a few years ago. It's a fairly easy dish and quick -- but it does take a while to clean and debeard the mussels! The broth was made up of lime zest, sugar, green curry paste, fish sauce, light coconut milk, clam juice, and seafood broth. N also added onion, garlic scapes because I had so many, and a whole lot of fresh coarse chopped cilantro. I threw together a quick Caesar salad (more green!) and we had some tasty store-bought bread to sop up the broth. Because this is the summer of fru-fru drinks, we tried a new one on recommendation from one of N's coworkers. He suggested a hot charlotte, which is very much up my alley. Even our drink was green! 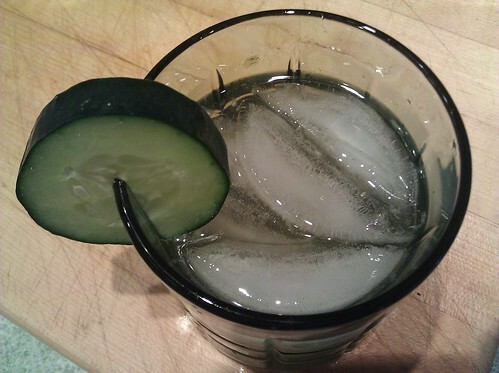 I like this drink -- cucumber is muddled with tobasco and then gin and St Germain are added. It is interesting how the tobasco does not really come through as tobasco-hot-vinegary-hot and instead just as another layer of flavor. After a lengthy dinner, we opted for the mostly mindless and a bit contentious Uno. I flexed my Uno skills and some luck and managed to win the game. Woo hoo! ... fru fru drinks. It is like I just discovered the refreshing power of an ice cold beverage. pour over ice, and enjoy. It was good. I would have liked more lime. Mmm. For the longest time, I try to avoid sweet drinks, but I give in, for this summer. 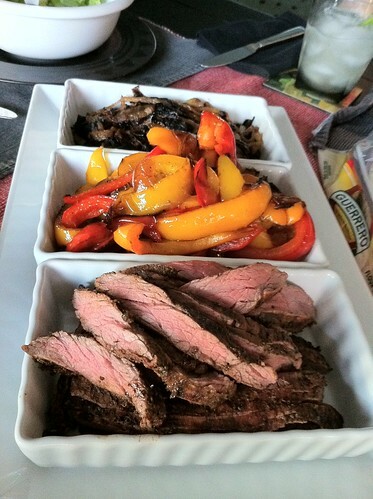 For dinner, I recycled a perennial favorite - flank steak. I needed a break from pork. Even thought I wanted to make the rhubarb chutney you suggested. I may still make it and put it up in a jar. Oh hey, more specialty kitchen equipment. I marinated the flank steak in V8, lot of Mexican oregano, and a dash of cumin. G suggested adding some Worcestershire sauce next time. (Hmm, I wonder where he learned that. The tv, perhaps!) He grilled them up while I sauté the peppers and caramelized (or burn) the sweet onions. Guacamole (of course! ), sour cream, jar salsa, tortilla, and some cheese out of a plastic bag to go with the meat. Easy does it when it is hot and we are busy fighting with the weeds in the yard. Oh, I totally forgot to cut and put out the lime. A squeeze of lime would have perked up the wrap. G and N ended up arguing about the amount of Tower stock he owned. I still think you won. N was right on when he said he and G will always find something to argue about. I did not win, again. Even though quite a few of the hotels I owned, majority and minority, were acquired. 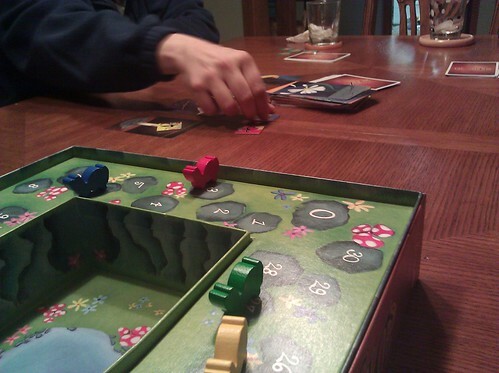 Afterwards, we played a night cap of Guillotine, then encore night cap of Bohnanza. Go you with the hat trick! You won all three games.